I’ve always enjoyed reading your language arts approach, Lucinda, and each time feel very inspired by what you’re doing. As an aside, I’ve been very curious how your Dyson vacuum lab turned out. Are you still planning to post about that? Hi Katharine, It’s lovely to meet another BW fan. Thank you so much for stopping to say hello in such a kind way! Gosh, you’re right! – I never did post about our vacuum cleaner science, did I? We didn’t do much with the actual Dyson pack in the end – we might ask to borrow it again when the children are a bit older. But we did find out a lot about how different types of vacuum cleaners work, and C(10) made a video presentation about everything she learned. Thank you for the reminder – I shall look back at my photos and if I can remember enough I’ll put together a post. Isn’t BW fabulous? I feel so appreciative that Julie and her team are around to support me in my homeschooling career. Great Post! I like how you shared your favorite opening hooks from books first. We’ve also been doing lots of Brave Writer inspired activities too. Today we wrote our own Presidential slogans after reading some from the past. 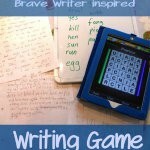 Brave Writer is awesome! Thank you, Julie. I love the sound of your Presidential slogans activity – we might try something similar! I could not agree more with the quote. What a great exercise! Thanks, Carol. As my children get older, I like these little reminders that they are still actually quite young and that I shouldn’t force the pace too much! Welcome back, sorry I’ve been a bit scarce! How are you? Love that my kids are such avid readers – at times it feels like my only comfort in this homeschooling journey!! I need to get into BW some more. Am planning to try and work through all your science posts this term, starting with the gummie bear one! How lovely to hear from you, Claire! I’m surprisingly well, considering autumn has suddenly arrived here in England. I was looking at spring-like photos on Sue’s blog yesterday and feeling rather envious of you southern-hemispherers. Still, can’t complain – we had a good long run of summer right up til last week. Ooh – have fun with the science! And do let me know how you get on. We’re playing with laser pointers at the moment. I can’t decide whether to post about it or whether people will think me very irresponsible. How did you get on with the Mandarin?? I haven’t really thought about how our favorite books begin…but we’ll be watching for those opening hooks now! I hadn’t either, until I saw it mentioned in the Arrow. 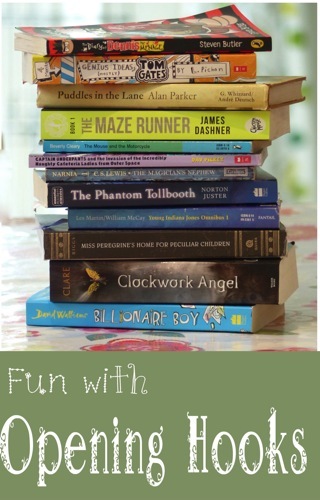 It’s fun to find a new way to appreciate good writing! We tried your activity today and proved to be a difficult to please crowd! I think a 7 was the highest rating any of us gave a book. Well, except my 6yo who awarded ratings into the millions for his favorites! 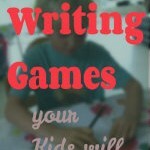 We also did our weekly Freewrites and I was delighted to see that my boys played around with opening hooks. A couple of them have been writing ongoing sagas for quite sometime. 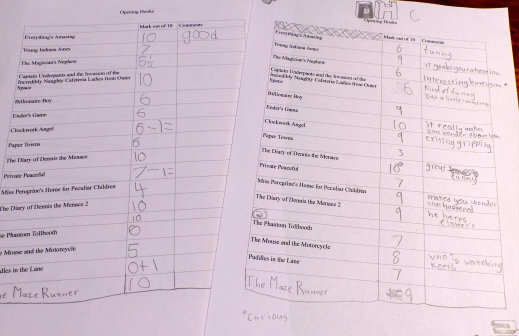 My 15yo turned back to his first installment and came up with several new openings, including our highest ever rating the day: Eight years before Alexander Hendricks had the best day of his life, his father Thomas had the worst day of his life. Thanks for the inspiration! I love that your 6yo was so extreme in his appreciation. And I do like your 15yo’s opening – how intriguing, I want to read more! Imogen and I were talking about hooks in last week’s podcast about writing! We can learn so much from reading successful authors’ writings and observing the techniques they have used. I do that all the time! It sounds like you and C are really enjoying writing together. Will you both be doing NaNoWriMo? Sue, How funny that you were talking about hooks! I shall look forward to listening. I am so pleased you’ve put your podcasts on iTunes, so I can listen to them offline. Yes we are enjoying writing very much lately. Thank you for your encouragement! I think we will both have a go at NaNoWriMo, yes. I was feeling a bit daunted by the idea of writing 50,000 words. But then I realised I could have any number I choose as my goal, and better to write 20,000 than none at all. Now I’m feeling rather excited at the prospect! Thank you, Karen. I shall look forward to reading Keilee’s novel one day! C’s opening hook is great – oh why is that boy falling?! 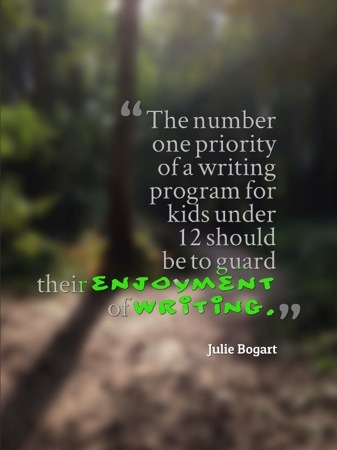 Sounds like a great approach to encourage writing…I wonder if I can sneak that into some of our walks? This was interesting. The kids in CC were just talking about opening hooks as they were working on some literature papers. I love your approach here. Inspiring! I think every parents should read this article for their reference of opening hooks.